A recent poll by The New York Times and Siena College found the race in a statistical tie. 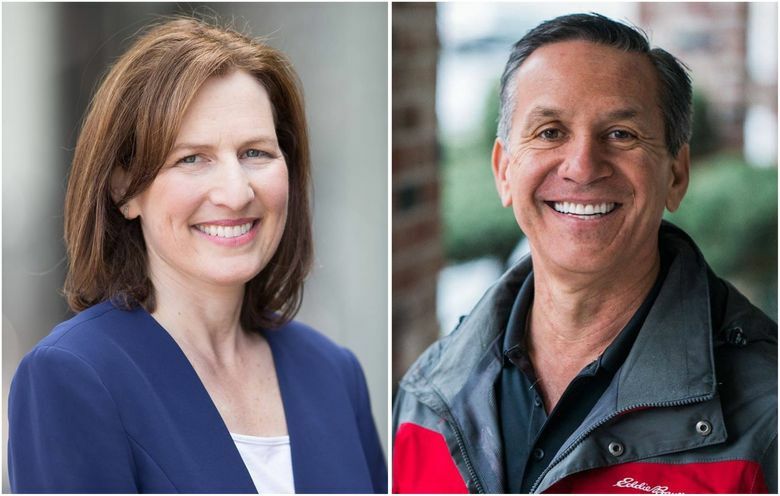 Voters may have just one chance to see Dino Rossi and Kim Schrier square off in a debate before the Nov. 6 election in the 8th Congressional District. Rossi, the real-estate investor and former Republican state senator, has declined multiple invitations to appear alongside Schrier, the pediatrician and first-time Democratic candidate, at debates and candidate forums. He has agreed to participate in an Oct. 17 debate in Ellensburg organized by the Washington State Debate Coalition. The one-hour debate is scheduled for Central Washington University’s McConnell Hall, starting at 7 p.m. It will be broadcast live on KING 5 and other outlets. Andrew Bell, Rossi’s campaign manager, confirmed Thursday the candidate is planning on the single debate. In an interview last month, Rossi said he is focused on the debate coalition’s event because it will be well-publicized and reach a significant number of voters. “I’ll prepare for the big one. That’s the one people are gonna pay attention to. You know doing a little forum here and there, no one is going to pay attention to that,” he said. Rossi’s campaign has declined several other invitations to appear at candidate forums or debates with Schrier, including at retirement communities, nonprofits and other organizations. Cynthia Stewart, president of the League of Women Voters of Tacoma-Pierce County, said the group offered two dates to the Rossi campaign but was turned down. “We very much regret not having both candidates available. This is such an important race,” Stewart said in an email. Northwest Harvest, the hunger-relief nonprofit, also worked with religious organizations to line up a debate at a church in Wenatchee in mid-October but couldn’t get a commitment from Rossi, said Christina Wong, the group’s advocacy director. “There is a clear difference here: one candidate, Kim Schrier, who values transparency and openness, and another candidate, Dino Rossi, who would rather hide than risk voters hearing how far-right he is on the issues,” Rodihan said in an email. Jostling over the number and format of debates is common during election season, with challengers typically asking for many debates and incumbents finding reasons to say no. While Rossi is not an incumbent, he is very well known as a three-time candidate for statewide office. In Washington’s U.S. Senate race, two televised debates are scheduled between Sen. Maria Cantwell, the Democrat seeking a fourth term, and Susan Hutchison, the former TV news anchor and former chair of the state Republican Party. The first is Monday, Oct. 8, at Pacific Lutheran University, and the second Oct. 20 at Spokane Community College. Cantwell initially would not commit to those debates, but later agreed to attend both. The 8th District contest to succeed retiring U.S. Rep. Dave Reichert, R-Auburn, is one of two dozen or so contested races that will decide whether Democrats or Republicans control the House of Representatives next year. A recent poll by The New York Times and Siena College found the race in a statistical tie. Rossi showed greater eagerness for debates when he challenged Democratic U.S. Sen. Patty Murray in 2010. That year Rossi sought six televised debates — five in the state and one on a nationally televised political talk show. Murray agreed to just two debates, one in Spokane and one in Seattle. Information on attending, viewing or suggesting questions for the Rossi-Schrier debate Oct. 17 can be found at the website of the Washington State Debate Coalition. The site also has details for the two upcoming U.S. Senate debates.